You have just taken the first step towards your dream of riding a motorcycle or moped. Whatever your motorcycle goals you have come to the right place as we provide bespoke training tailored to your individual needs. 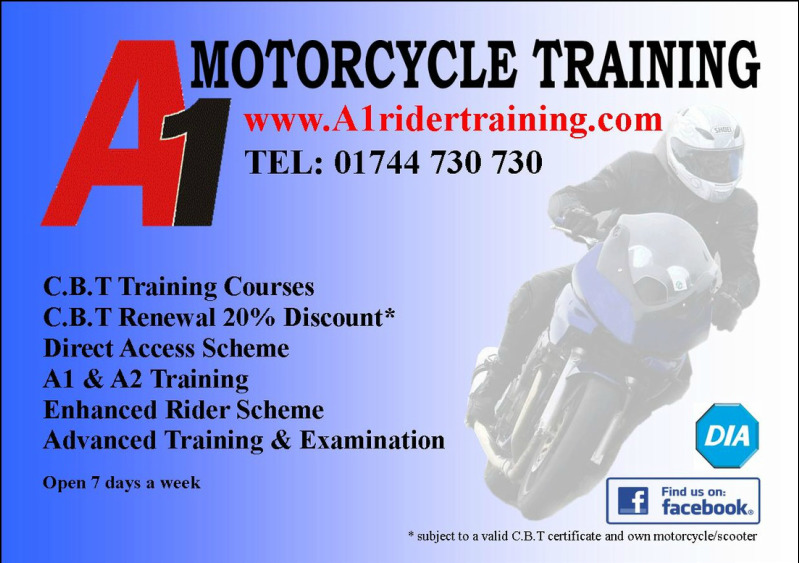 Here at A1 Rider Training we are fully qualified Learner Rider Instructors, Post Test Trainers and Advanced Instructors/Examiners. Our staff are highly qualified D.V.S.A certified instructors who have all completed the D.V.S.A Cardington assessment and who also hold the D.V.S.A post test trainer qualification known as DVSA ENHANCED RIDER SCHEME TRAINER. Our training site at mmc has onsite facilities within the complex that no other St Helen's school can offer. Male and Female bathroom.Great food from the bistro during your lunch break. Buy a new or used bike with all the equipment and clothing you need. There is even a M.O.T and service/parts department to keep you on the road. Free car parking. Advice from a multitude of staff. Chill out in the lounge with a drink at the end of your training session. Now who else in the Merseyside and surrounding areas can offer all this in one venue?